Kerb stones can be used for delineation to clearly indicate borders and boundaries, and achieve a well-designed finish. 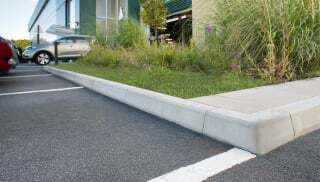 Whatever your requirement, Marshalls can provide the solution – from our rich granite Conservation Kerb units to British Standard Road Kerbs, Channels and Edging. In addition, more specialist types are available in the form of our high containment kerb and Bus Stop Kerb. Our experienced team of design and pavement engineers can assist you in selecting the most appropriate kerb stones for your scheme. Marshalls understands that while kerb stones are intended to perform a function you also need them to be visually appealing, and in keeping with the desired style of the scheme. Marshalls' kerb stones are offered in a range of sizes, materials, angles and colour tones, providing multiple options to meet the requirements of your design. Choose from natural stone including Yorkstone, Granite and Sandstone, or browse our range of concrete kerb stones to find the right specification for your project. Explore our full range now.